When providing asbestos roof removal in Redlands CA, we take all possible precautions to protect against indoor and outdoor contamination. First, we prep the work area by sealing all ducts, vents, drains, etc. 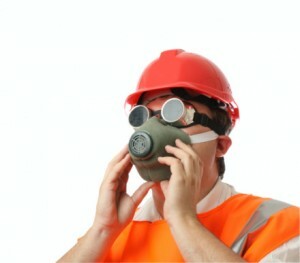 to make sure no asbestos dust will be able to get into the building during work. We work in small sections during the removal process, wetting the asbestos-containing materials as we go to help minimize fiber release. We clean as we work and again at the end of the job, to ensure the site is safe for your roofing crew to work on. When you work with AQHI Inc. for your asbestos roof removal in Redlands CA, waste disposal costs will be included in our bid. We are licensed for asbestos waste transport, so we can not only bag the waste as it is removed from your roof, but also remove the bags to an appropriate disposal facility. Yes. Not using a certified contractor for asbestos roof removal in Redlands CA puts everyone at risk for serious health problems related to asbestos exposure. This includes the workers, the building occupants, and the community. You really do need to invest in professional service from a licensed and insured contractor like AQHI Inc. We will keep everyone safe and make it easy to secure any necessary reoccupancy permits. If you would like more information on asbestos roof removal in Redlands CA, please call us at 800-481-8080 today. Our asbestos removal office for Asbestos Roof Removal in Redlands CA is open Monday through Friday between 8:00 AM and 5:00 PM and closed for lunch from noon to 1:00 PM. With advance notice, projects can be scheduled for weekends, early mornings and evenings.